You are here: Home>Local history>Areas>Milton Keynes>Milestones in Milton Keynes area by Norman. 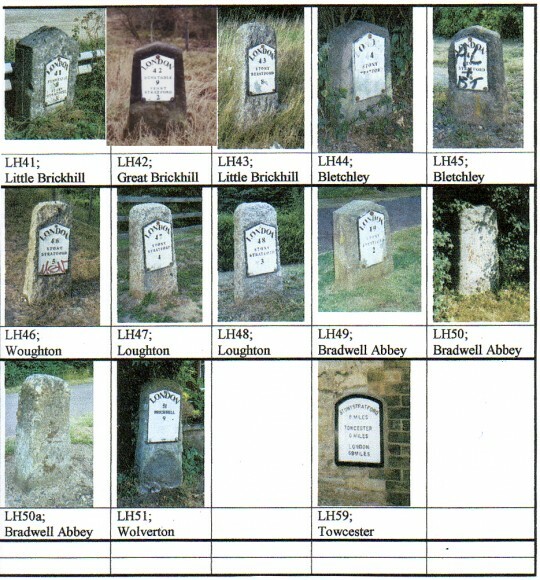 Milestones in Milton Keynes area by Norman. Today I came to the Milton Keynes Museum to study at Living Archive. I live in Woburn Sands. The journey took about twenty minutes, I did not see a single mile post but some are still there. Starting with the A5 or Watling Street which has long been a major route since Roman times. This route from London to Holyhead was” TURNPIKED “by Telford and thus Milestones were erected every mile as Way-markers and means of calculating the use there-of. Turnpikes had to be authorised by appropriate acts of Parliament. Everybody had to pay to use it on a sliding scale of charges and was controlled via Tollbars and Toll Houses for the Toll collectors. The advantages were that travel times were much reduced for instance the A5 was the major route to Ireland and thus considered very important. Thomas Telford’s on the London-Holyhead Turnpike consist of an upright stone with its detail on an attached metal plate. 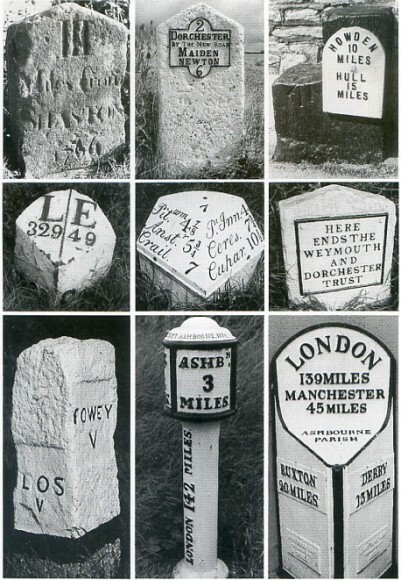 Since about 1745 milestones became compulsory on most roads and in 1766 their use was extended further. Turnpike Trusts were expected to erect them along the roads they were responsible for. Where have they all gone? Many have disappeared due to road works, road widening, etc in 1939 the government of the day, feeling that the Germans were about to invade, had all milestones, signposts and waymarkers removed defaced or buried in order to hinder their progress. When hostilities were over milestones should have been restored to their original positions but not all county councils did so . There were many put back in Bucks where-as Bedfordshire has very few. More have s since been lost by traffic accidents and verge trimming flails. For instance the A5 has a sequence running from the Bedford shire boundary through to Stony Stratford Erected to show travellers how far they have come and how far to go they are now part of road travel history. And have been superseded by modern style road signs more visible to faster traffic.